traditional swimming pools, in a fraction of the space. 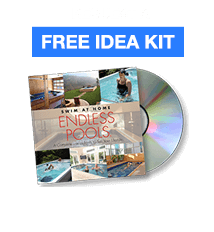 Request our Free Idea Kit and see for yourself how adding an Endless Pool can improve your quality of life. Visit our Photo Gallery to see examples of our pools installed in customers homes. Browse our Video Gallery to experience and understand how Endless Pool's products can benefit you. You’ll be able to swim whenever you like, on your schedule, at your speed. No more traveling to the local leisure centre. Just your own compact pool, where you swim or exercise against a broad, deep current that's adjustable to any speed, stroke, or ability. An Endless Pool is simple to install, easy to maintain, and economical to run. Indoor installations allow you to swim year-round in any type of weather. The small footprint means our swimming pools use fewer resources and energy than traditional pools. It's the intelligent choice in pool ownership. Swim or exercise against a smooth current that's fully adjustable to any speed or ability.